It’s dawn at the Taj Mahal. The first pale rays of sun cast an almost ghostly glow over the white marble edifice before us. The air is still, with the humid promise of yet another scorching day ahead. Standing amongst just a handful of early visitors, it feels like we have the world’s most famous monument to love all to ourselves, and the fact that we’re sharing this moment, together as a family, is truly special. India with kids? You’re mad! The thought has crossed my mind. We’ve all heard tales of the horrors of “Delhi belly”. However I take the negativity as a bit of a challenge. 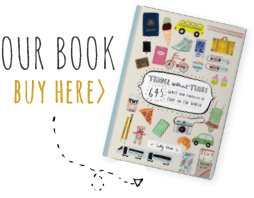 Having just published a book on travelling with kids, there is a part of me that wants to practice what I preach. We’ve been invited to a wedding in Chennai and decide to make a family trip of it, spending just over a week in Delhi, Rajasthan and Agra before heading south. This beguiling and mystical country has been on my personal bucket list for years, and how often do you get invited to an Indian wedding? You don’t go to India without substantial preparations, particularly if you’re travelling with kids. On a practical level there are visas to apply for – a perfect introduction to the mind-boggling bureaucracy of India. A tip for young players: allow plenty of time. The photo requirements alone do my head in: precisely 300 x 300 pixels for the on-line application – I end up sending our passport photos off to a man in Bangladesh to resize – but two inches by two inches for the printed photo required. Staying healthy anywhere with kids is important but in India it’s imperative. There are vaccinations to be had – 11 injections between us variously for Hepatitis A, Hepatitis B, Typhoid, Diphtheria, Tetanus and Pertussis – and a bagful of diarrhoea medication, rehydration salts and extra-strong repellent to pack. It sets us back $1000, but what price health? Our travel doctor lectures us on how best to avoid getting sick, by eating cooked food only, avoiding ice unless we know it’s clean, and drinking water (and cleaning our teeth) from sealed bottles. The children are warned not to pat dogs, cats or monkeys as rabies is rife. 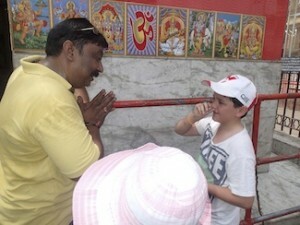 We also work on getting the kids engaged with the forthcoming trip. 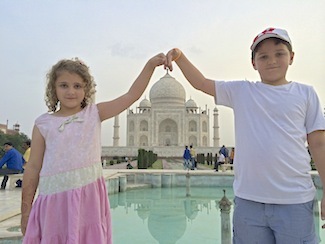 Lulu, 8, unearths a fabulous Indian cookbook and announces she’d like to stay at the Taj Mahal. 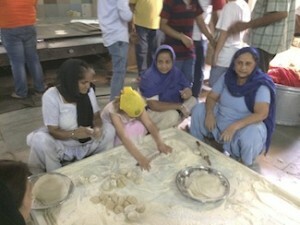 She does a school project on India even before we leave home. Her brother, Archie, 10, is keen to practise Indian dining etiquette, sitting on his left hand and eating only with his right. Our route is a reasonably well-worn tourist path from Delhi, through eastern Rajasthan, the land of the kings, and across to Agra in the neighbouring state of Uttar Pradesh, travelling by private car with driver and on India’s famous trains. With kids in tow, however, I realise we’ll need a little comfort and the security of travelling with an operator who knows the region well. It’s about 45 degrees in the shade on our first day and we’re reminded that July really isn’t the best time to travel here. Even the hotel pool at the uber luxe Taj Mahal hotel in New Delhi’s leafy embassy quarter is hot. The following morning we meet our tour leader Mahi, who travels with us for the next week, and delve into the pulsing heart of Old Delhi. After a short masterclass in Hindu deities – monkey man Hanuman becoming the kids’ instant favourite – he takes us to Jama Masjid mosque, India’s largest, a massive red sandstone and white marble structure built between 1644 and 1658 where we literally hotfoot it across the scorching stone courtyard that can fit up to 25,000 worshippers. The heat is oppressive and the nylon full-length robe I have to wear makes it worse. The mosque is magnificent, and definitely worth seeing, but we’re happy to leave. 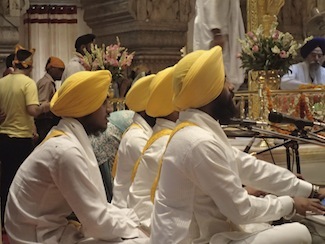 A mix of jetlag and heat exhaustion almost takes its toll on Lulu and for a moment I think those naysayers might have got it right, until we enter Sheeshganj Gurudwara, a Sikh temple, where music is playing and everything feels more zen. In the langar, a free kitchen that churns out food for thousands of worshippers every day, staffed by volunteers and run on donations, Lulu learns the finer art of rolling chapatis with a group of elderly women. Later we eat the flatbread with rice and dahl, sitting cross-legged on the floor. Reinvigorated, Lulu’s particularly keen to see the Red Fort, where the Mughal emperors lived and ruled, but with the mercury rising we snap photos at the entrance and retreat to our air-conditioned hotel before heading to Delhi’s station to catch our overnight train to Jodhpur. 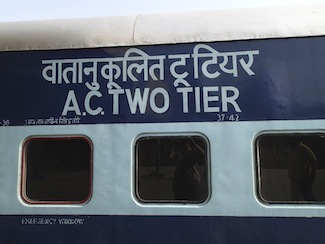 Long distance train travel in India is a must-do adventure, a chance to observe the entire spectrum of Indian society. 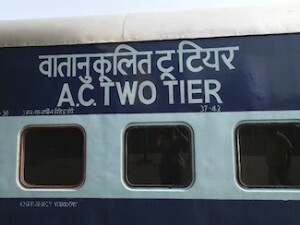 The reality of our two-tier, first class, air-conditioned sleeper cabin is very different to the third class, unreserved and non-air-conditioned seating at the rear of the train. Where we each have a sleeper berth, a pillow, a set of laundered sheets wrapped in brown paper and a curtain for privacy, third-class passengers are jammed into crowded cars or perched on luggage racks for the 13-hour journey. Seeing the mass of humanity crammed in I’m relieved that my ultra-budget backpacking days are well behind me. We’re lulled to sleep by the clickety-clack of rolling wheels on track and the noisy hum of the fan in our four-sleeper berth. When we wake it’s to views of dusty desert flashing past, punctuated every now and then by the vivid reds, oranges and bright pinks of Rajasthani women in their colourful saris. 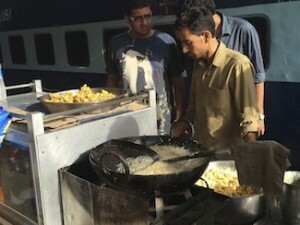 The kids learn their first words of Hindi – “masala chai, masala chai” – as the chai wallah makes his way down the carriage with a cauldron of sweetened, spicy, milky tea. It’s the beginning of an addiction that lasts well beyond our trip. On stations where the train stops, we find men with carts frying spicy pakoras in bubbling woks; we buy it by weight and eat straight from the newspaper it’s served in. In Jodphur, the Blue City, so-called for its mass of square houses painted Brahmin blue, the kids enthusiastically follow an audio guide through the spectacular Mehrangarh Fort which rises out of the rock on which and of which it is built. We indulge in lassi, thick fruit milkshakes, for which the city is famous. The next morning we’re up at 4.30am to take another train from Jodphur to Jaipur. Navigating the mass of bodies asleep on the station platform in the inky darkness before dawn is confronting for the kids, but a few cups of sweetened milky tea from the station chai-wallah helps sort us all out. The train is late, and when it comes it’s crowded, but this is train travel in India. What else were we expecting? We share our six-berth compartment with an old lady who speaks only Hindi, and doze as the train makes its way across the desert. 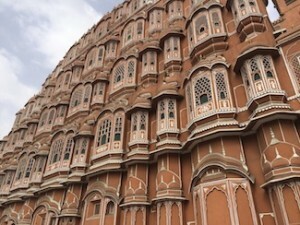 In the pink city of Jaipur, we are guided through the beautifully decorated City Palace, where members of the former royal family still live, see elephants being ridden through the streets, take photos of Hawa Mahal, the Palace of Whispers – the most photographed building in India after the Taj Mahal – from where women of the royal court would watch the goings on below them, and explore the immense and breathtaking Amber Fort, northeast of the city centre. The kids try their hands at fabric block printing, a major industry in these parts, father and son buy matching elephant-print shirts, and we check out jewellers selling precious and semi-precious stones. The family highlight is catching a Bollywood movie at the famous Raj Mandir Cinema, the interior of which is like the inside of a big strawberry pavlova. The movie’s in Hindi without subtitles but it doesn’t matter a bit; I’ve never heard my daughter laugh this much. Between Jaipur and Agra we stop to see a potter at work, visit the famous Chand Baori stepwell and visit Fatephur Sikri which served as the Mughal capital between 1571 and 1585. We stop for the night at Karauli a rural village not far from Ranthambore National Park, famous for its Bengal tiger population. (When planning the trip we were super keen on doing a tiger safari and were disappointed to discover the park was closing the day before we were due to arrive.) Our accommodation Bhanwar Vilas, is a rural palace of sorts with the feel of a hunting lodge, gorgeous guestrooms and a stunning courtyard. We’re greeted with ceremony receiving bindis and marigold garlands upon arrival, and take a walk into the local village where tourism doesn’t exist. We’re the only guests in residence, and the kids decide an impromptu fashion parade is in order, helping themselves to the contents of the palace’s little shop selling clothes and handicrafts by local artisans. We bring home several spectacular additions for the dress-up box. Indeed you can’t help but go a bit native, sartorially speaking, when in India. Western clothes are just boring in comparison to the elegant silky saris and tunics and kurtas in gorgeous printed cottons. 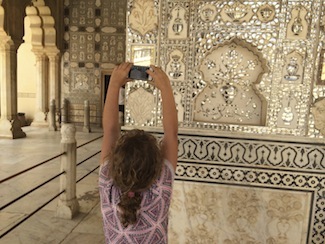 For the kids the highlight of the trip is the warm and wonderful Mahi, our tour leader, who fascinates them with stories of the Maharajas who ruled this land, and legends relating to the Hindu gods. Where possible he enables us to interact with local people – a potter here, a carpet seller there – to get a true sense of how they work and live. He also has the very useful ability to know when it’s OK to have ice in our drinks. His expression “100 per cent safe” becomes the catch-cry of the trip. And when we eventually say goodbye there are tears all around. For me, one of the highlights is having enough comforts laid on – accommodation, transfers, decent cars, good drivers – to let me relax and think about what we’re seeing rather than worrying about the logistics so often associated with family travel. The kids struggle a little with the food, finding the reality of “not very spicy” different to what they’re used to at home. I reason that mango lassi, naan and hot chips cover several essential food groups. We have eight days of extraordinary moments, from travelling by train to visiting forts and temples including the abandoned Mughal city of Fatehpur Sikri and the stunning Agra Fort. The kids love it all. But seeing the Taj Mahal at dawn is the absolute highlight of the trip. I had worried that the reality wouldn’t live up to expectations. I needn’t have. The kids are as moved as we are by the story of devotion that is the foundation of the building. Our 4.30am start is painful, but means we can avoid the crowds for the all-important photo opportunity. 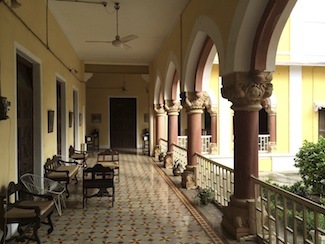 If we did the trip again, I’d make sure to travel at a different time of year when it wasn’t so hot, we’d do a tiger safari, and we’d up the ante on accommodation to experience some of Rajasthan’s glorious palace hotels. However, none of us laments the trip that wasn’t, we celebrate the trip that was. And the fact that we took the kids to India and no one got sick. This is an edited extract of a feature article first published in International Traveller magazine, July 2015. Want to do this exact trip? Let Travel Without Tears help you make it happen. Click here for details.